Bell peppers, whether they be green, red or yellow, are a staple in many homes. Encourage the purchase of organic bell peppers in your department to boost the bottom line as their sales are growing. Organic bell pepper sales in 2016 rose 33%. Don’t miss the opportunity to capitalize on those growing sales. For more information on variety characteristics, visit our conventional peppers page. As bell peppers are a staple item in many households, they are a good place to start when encouraging consumers to purchase organic. Include peppers in an organic salad promotion with other organic salad vegetables. Include organic salad dressings in your promotion. Try cross-promoting bell peppers with different organic dips. Create party trays that include all organic produce and include sliced bell peppers on the tray. Consider displaying organic peppers next to their conventional counterparts in a display designed so the conventional and organic produce are separated. This allows consumers to find the organic product where they would normally look for it. Another option is to display organic bell peppers in a separate organics section, allowing consumers who are looking only for organics to find everything they need in one place. Try both options to see what works best in your department. Offer a variety of colored peppers to create an attractive display and to appeal to consumers looking for more than just the traditional green bell pepper. Consider offering a three-pack of different-colored organic peppers. 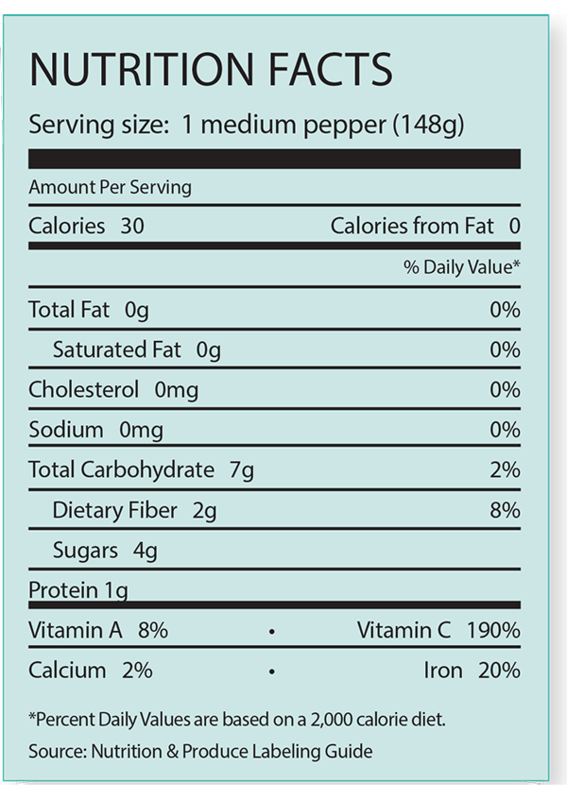 Consider adding organic mini peppers to appeal to consumers looking for a way to use peppers as a snack. Organic bell peppers are available in a variety of pack sizes similar to conventional bell peppers, including 25- and 30-pound cartons. Organic stoplight packs (one red, one yellow and one green pepper) are often available in cartons of 10, 3-count packages. Organic mini bell peppers are often shipped in cartons of 12, 12-ounce bags. Just 7% of consumers who purchased bell peppers said they exclusively purchased organic bell peppers. However, an additional 13% of shoppers who bought bell peppers said they purchased both conventional and organic bell peppers.